Low Carb Chocolate Peanut Butter Cookies - Home. Made. Interest. 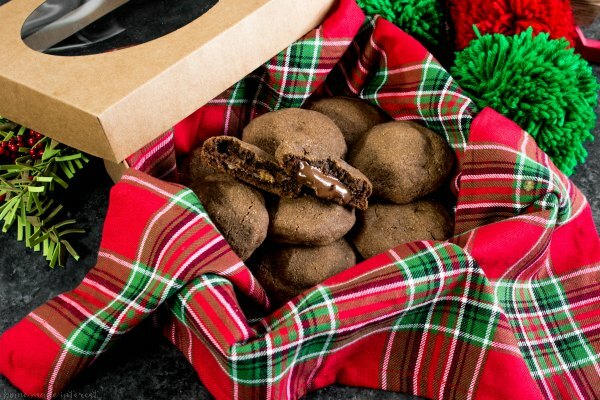 This low carb cookies recipe for Low Carb Chocolate Peanut Butter Cookies is going to bring a smile to someone’s face this holiday season! If you’ve ever eaten low carb, or have a friend or family member who eats low carb you know they holidays can be kind of tough. This year I was determined to come up with a low carb cookie recipe that I could give to friends and family. These Low Carb Chocolate Peanut Butter Cookies are definitely going to put a smile on their faces! Since we’re cutting out the carbs my Low Carb Chocolate Peanut Butter Cookies are made with Bob’s Red Mill Almond Flour. I love that it ground super fine so it is closer to the texture of flour. 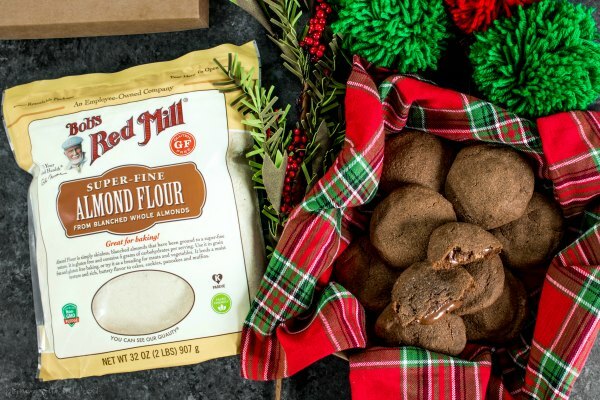 Bob’s Red Mill offers two types of Almond Flour, Natural, which is ground from whole almonds with the skin intact, and Blanched which is made from almonds that have been blanched to remove the skins. 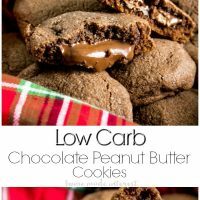 I like blanched because it’s color more like flour but since these low carb cookies are chocolate it really doesn’t matter which you use. 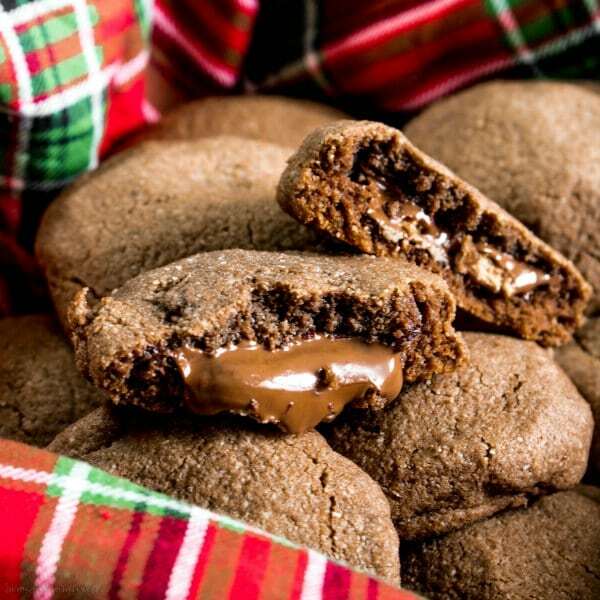 We all like to indulge during the holidays so I wanted to make these Low Carb Chocolate Peanut Butter Cookies extra special for my friends who are avoiding carbs. The cookie dough is made with unsweetened cocoa powder to give it a chocolate flavor and inside each low carb cookie is a deliciously decadent sugar-free peanut butter cup. OMG, they are amazing! As someone who spent a few years avoiding all carbs these are pure heaven. They are the best right out of the oven when that peanut butter and chocolate is all melt-y and amazing but when I had one the next day I stuck it in the microwave for just a few seconds and it melted the inside all over again. Yum!! I have a list of friends, co-workers, and family that I am making these very special low carb cookies for. Each one is getting their own box that I’ve lined with a Christmas-y linen napkin. It’s simple but beautiful and once they open that box they’ll only have eyes for their own special batch of low carb Christmas cookies! I know they are going to be so happy :). Looking for more Low Carb cookie recipes? 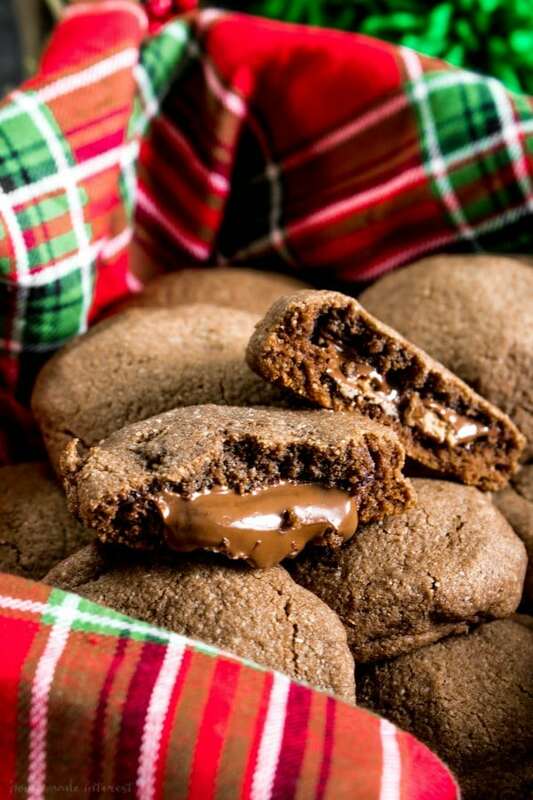 Check out our list of the BEST Christmas Cookies! 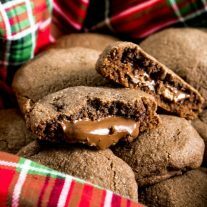 This low carb cookies recipe for Low Carb Chocolate Peanut Butter Cookies is going to bring a smile to someone's face this holiday season! In a small bowl combine the almond flour, cocoa powder, baking soda, and salt. Set aside. In a mixer cream together butter and sweetener until fluffy, about 2 minutes. Add egg and vanilla to butter and continue to mix. Slowly add the dry ingredients to the bowl continuing to mix until all of the ingredients are fully incorporated. Scoop 2 tablespoons of dough from bowl and form it around a sugar free peanut butter cup. Repeat this process until all of the dough has been used. Place cookies on a lined baking sheet and bake for 10-12 minutes. Let cookies cool for 5 minutes on the baking sheet then move them to a cooling rack to cool completely. Note: We are not nutrition experts. The net carb calculation was done using the MyFitnessPal nutrition calculator. I made them and the dough was a little dry so i added a little bit of milk, but in the end they were pretty good. Have you found a non-granulated sugar sub that produces a good product? My experience with them has not been good! There is liquid sweetener but not sure it can be substituted in this recipe.